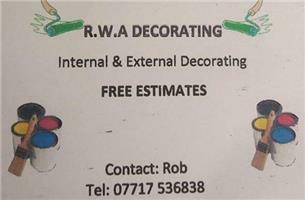 Hi, Welcome to R.W.A DECORATING. I started working for myself in 2008 and have been offering quality advice and services in painting and decorating ever since. I have 17 years of experience after completing my NVQs at Chichester college. Give Rob a call today on 07717 536838. Bognor Regis, Chichester, Selsey, Havant, Hayling Island, Pulborough, Hampshire, Surrey, West Sussex.